or businesses, people leave people. Chuck Inman developed Crystal Clear Motivation in 2008, and has been working with professionals and business owners to help them manage some of the key challenges into today’s business world. 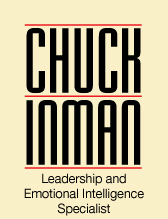 Chuck Inman is a global leadership, behavior and emotional intelligence expert. 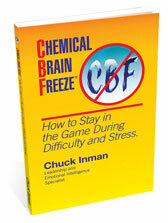 His topic Chemical Brain Freeze® is a dynamic program that addresses two key challenges in today’s business world. Chemical Brain Freeze® offers the distinct advantage of showing leaders how to develop better relationships and help people through change more effectively. With leadership and emotional intelligence at its core this program demonstrates how to effectively manage the challenges we face in the workplace. Connect with Others More Effectively. Imagine being able to be your best during times of anxiety and stress. Learn how you can stay in the game during difficult times and be more effective than ever. With today’s fast paced environment, challenges arise daily and its what we do with these challenges that have an impact on our performance. Chuck combines the latest research with years of business expertise, world travel and knowledge as he teaches this subject matter. No one is immune to a chemical brain freeze.. It’s not if but when it will hit you. multiple black belt martial artist and co-author of Competitive Positioning.